The wonder of it all is that the Africa of your imagination does in fact exist. 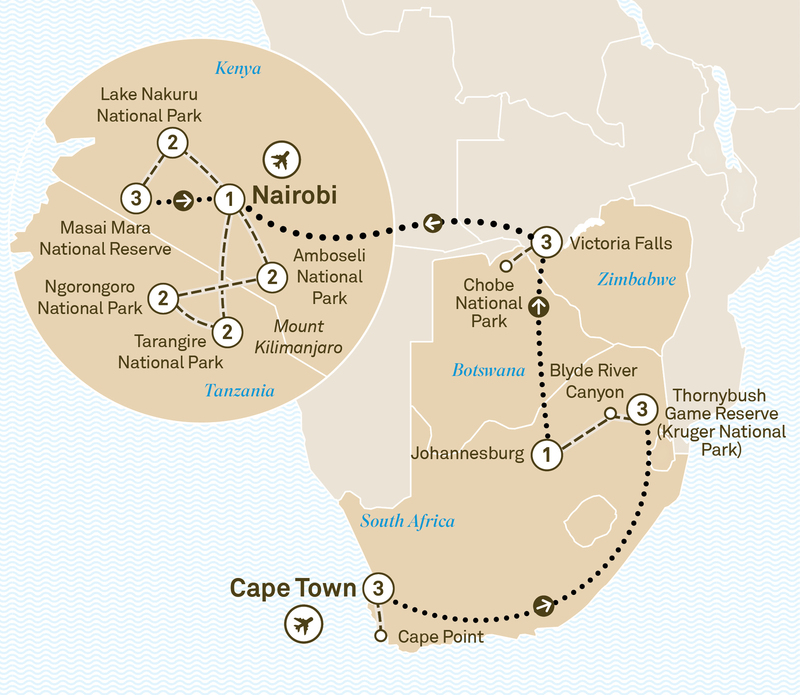 In so many ways, Africa is just as you’d always dreamed it would be. It’s a place with vast herds of elephants and antelope, where lions roam the plains, and cheetahs chase down their prey with spectacular speed. It’s a place with many monumental wonders, Cape Town’s Table Mountain, and Zimbabwe’s Victoria Falls, to pick out just two. It encompasses all the splendour of Kenya’s highest mountain peaks and Tanzania’s great rolling grasslands. And best of all, it’s available right here in one complete, convenient and wondrous journey. Welcome to Cape Town. Your journey into wonder begins with a three night Special Stay. Ascend Table Mountain by rotating gondola for stunning 360 degree views. Sample South Africa’s finest vintages with a winelands tour. Alternatively, visit Robben Island, take a township tour, or a Harley DavidsonTM ride. Journey along the Atlantic coastline to Cape Point, stop at the Cape of Good Hope and visit Boulders Beach, home to an African penguin colony. Fly to Hoedspruit and transfer to your game lodge, adjacent to Kruger National Park, where you’ll enjoy a three night Special Stay. Set off on your first game drive this afternoon. Specially adapted Land Rovers are able to track the Big Five – lion, leopard, elephant, rhino and buffalo. Dine in the bush under a starlit sky with the sounds of African wildlife close by. Encounter more of Africa’s wildlife on your morning and evening game drives. There is an opportunity for a walking safari with your game ranger. Travel the Panorama Route en route to Johannesburg and see the Blyde River Canyon – the third deepest in the world. Stay at your stylish hotel for an overnight stay. Fly to Victoria Falls and marvel at the world’s largest sheet of falling water. Enjoy a three night Special Stay. Be treated to a special Sundowners cruise down the Zambezi River and watch the teeming wildlife on the banks. Enjoy a cruise on the Chobe River, home to vast herds of elephants and buffalo as well as a game drive along the shoreline. Visit a typical Zimbabwean village to gain unique insights into traditional tribal life. Get up close and personal during your visit to an elephant sanctuary. Witness the power of Victoria Falls from the Zimbabwean side. Later, enjoy dinner in the beautiful Livingstone restaurant to complete your day. Fly to Nairobi where you’ll stay overnight. Drive to magical Tanzania and spend two nights at your luxurious lodge in Tarangire National Park. Take an early morning game drive in search of Tarangire’s famous tree-climbing lions. Enjoy a traditional dance by a local tribe within the lodge grounds. Travel to Ngorongoro Crater, ‘Africa’s Eden’, for a two night stay at your lodge, on the crater’s rim. Witness sunrise over the crater before an extended game drive along the crater floor, reputed to contain the largest number of predators. Gaze at Mount Kilimanjaro, as you travel across the dry plains of Amboseli National Reserve. Your lodge, your home for two nights, sits beside a major elephant trail with views of the mountain. Journey north into the heart of Kenya to Lake Nakuru for a two night stay at your lodge, overlooking the lake. The shallow alkaline lake near the town of Nakuru is home to vast bird populations. Visit the Lake Nakuru Orphanage centre, established by an Australian family, and draw a little closer to Africa and its wonderful people. The Masai Mara is home to 95 species of animals. Enjoy a three night stay inside the reserve. Game drives through the Masai Mara encompass all types of animals, from lions, cheetahs, and leopards, to vast herds of zebras and antelopes. Visit a traditional Maasai village and learn about this complex and proudly independent culture. Join your Maasai guide for a walking safari or join an African cooking class. Enjoy an exclusive farewell bush breakfast out on the open plains of the Masai Mara amongst the wildlife. Board your light aircraft for a scenic flight over the reserve to Nairobi where it’s time to say farewell to the magic of Africa. Please book flight to depart after 4pm.